I know my writing work is important because I get emails, tweets, and Facebook notes from online readers. But God reminds me often that my ministry isn’t just online … it’s offline, too. There are seasons when the most important heart I can touch is within arm’s reach. I open my arms and the small girl steps forward and enters my embrace. I expect her to be more hesitant, but she asks me to hold her. I cradle her thin, frail frame and peer into her blue eyes. Just five years old but her eyes are filled with stories . . . ones she’s not yet able to tell me. Maybe over time she will. I thought of my life and became unsettled when my husband and I welcomed two foster children to join our family. I don’t think I know “unsettled.” Not really. Not like this sweet girl. “It’s always scary going to a new home,” she confided in me just a few days after joining us. Tears fill my eyes as I hear her words, but I try not to let them show. The file the social worker gave me is three inches thick, and after reading the reports I discover our home is only one of many in recent months. Those homes were only meant to be temporary, but ours is meant to be her “forever.” Our words tell her that. When will her heart start to believe it? She is the older one, and she cares for her younger brother still. She alerts me when he’s waking from his nap. His voice is barely a squeak as it calls for “Mama,” but she hears it. I tell her that she can just be a kid now; I’ll watch out for her brother. That’s a concern she’ll no longer have to carry. She nods, but I can tell she’s waiting to see if she can really believe that, trust that. Some of her emotions are hidden, and others are displayed too loudly, too vocally, too wildly. She cries over the smallest problem and then looks to me for help. I can read the question in her eyes, “Are you going to help me with this? And this? And this?” She wants to make sure. She’s has a hard time believing it’s true. Believing that I’ll be there. That I’ll care. And even when she’s naughty I don’t get angry. Compassion seeps out. I know what she’s gone through . . . at no fault of her own. She was innocent and so many others have wounded her. I open my arms to my new daughter. She has given me a glimpse of the love of God as I’ve never known. I understand His love for me better. I know His compassion for me more. He knows the pain I carry, too, often at no fault of my own. And when I act out, or cry out, or reach out, He—my God—wants nothing more than to open His arms of love. And He CANNOT wait for the day when I’m ushered into His forever home. I thought we were opening our home to help the orphans, but I am the one who is helped. Thank you for the sweet little lives you’ve blessed me with and the constant reminders they show me of Your love. May my parenting point them to you, the perfect Father. What a comfort to know my forever home is in your loving arms! A,very loving and touching post Tricia. Sometimes I wonder why some children are born into loving families and why some are not. Or maybe they were and have lost a parent or both parents and there was no family members to care for them. Your little girl sounds precious as she cares so much for her little brother. How long has she and her brother been with you and your husband ? May God Bless you both for what you are doing for these children. Hi Tricia. Thank you. 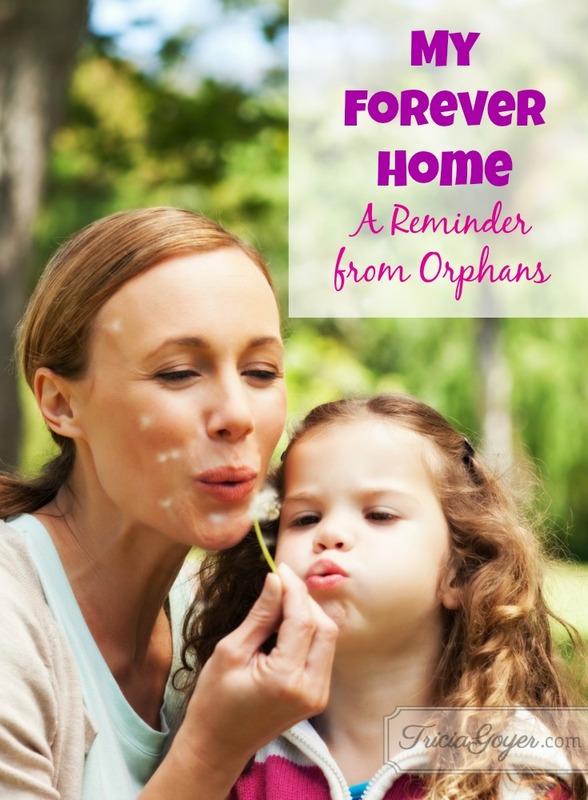 I read this post because my heart breaks for orphans, and I long to take them in. I’m always seeking for my information, leading, confirmation and praying for God to make it happen. But what I received here is not at all what I expected. You see, right now we are struggling through a very rough time, and I’m feeling like your little girl needing to believe what I know to be true – that God will take care of this, and this, and this, and that his compassion is so huge when he sees me struggling. I can’t tell you how much this just meant to me. Thank you. I pray blessings on you this day, this blessed Easter weekend and in days to come. We too have just opened our home to precious orphans through foster care. We currently have three and while it is a transitional placement, we are trying to work out if we can make it permanent. Foster care has made me rethink my parenting of both our bio and foster kiddos. I feel like tears are always waiting to be released when the little ones are in bed. It is the hardest thing we’ve done, but it is undoubtedly the most worthwhile thing we’ve ever done. Our whole family is growing through this experience. May God bless you Tricia. I’ll be praying for you.